Installation view of Items: Is Fashion Modern? The Museum of Modern Art, New York, October 1, 2017-January 28, 2018. 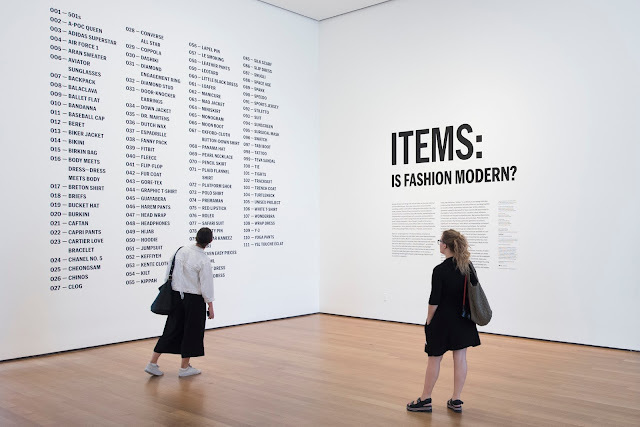 "Items: Is Fashion Modern?" curated by Paola Antonelli, Senior Curator, Department of Architecture & Design of MoMA is an ambitious exhibition covering a wide range of topics. It examines fashion's cultural impact, and positions fashion design in the even playing-field as the other objects of design, such as architectural models, video games, telephones and the first Mac computer, just to name a few items that are currently housed within the MoMA's collection. 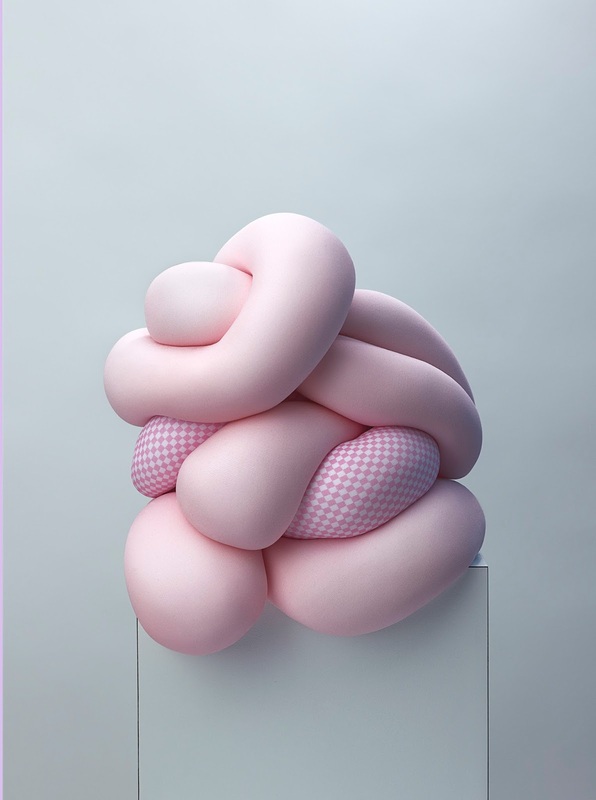 Because the exhibition taps into many different discursive context, such as industry, commerce, culture, geography, relational aesthetics, technology, craftsmanship, the environmental impact of fashion design, only to mention a few, it is difficult to write a review that would do its full justice. Now, rather than trying to touch on these topics that I've managed to pick out sporadically, I would like to examine the curatorial outcome of combining the everyday, and the banal with the concept-driven and the one-off pieces into a single exhibition. interpreted for Items: Is Fashion Modern? by Catherine Losing. © 2017 Catherine Losing. Image courtesy The Museum of Modern Art, New York. 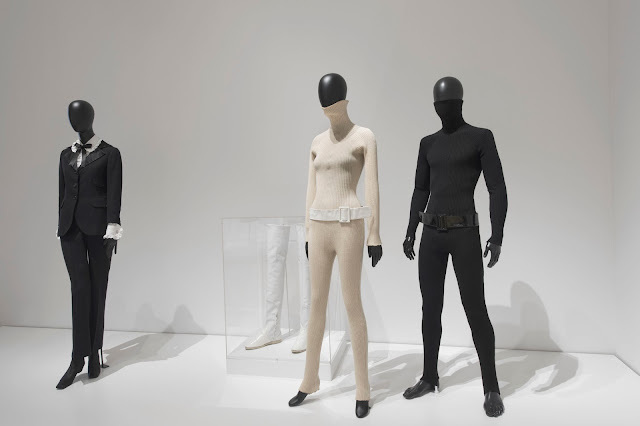 The mixing of "high" and "low," or, the one-offs with the mass-produced items adds a layer of complexity to the "Items" exhibition, in as such that it emphasizes on the social and cultural aspect, that lessens the focus on the comparison of the garments as clothes. For example, with choices such as the "Body Meets Dress" by Comme des Garçons and a plain white t-shirt, the curator forms a conversation about form and function, artistic expression and everyday-practicality. 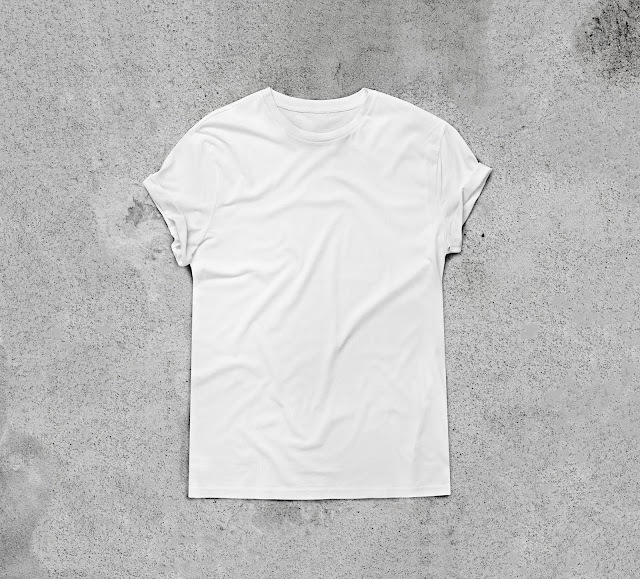 In response, Antonelli's choice of a plain white t-shirt adds the popular and the banal aspect of fashion in the discourse, also as to highlight the social function of clothes. Here the t-shirt is being presented for its function that over time has transformed into a social collective behavior connoting "the normal" and "the standard." Its mass appeal and popularity is in its banality. But, in the context of this exhibition, the simple t-shirt also begs to be viewed as conceptual, how? Shown on the wall, not on a mannequin's body obliterates its intended function. However, if the viewer should immediately visualize it on a body, the t-shirt's function is indirectly implied. Along with items such as "Body Meets Dress," the simple t-shirt symbolizes fashion democracy. 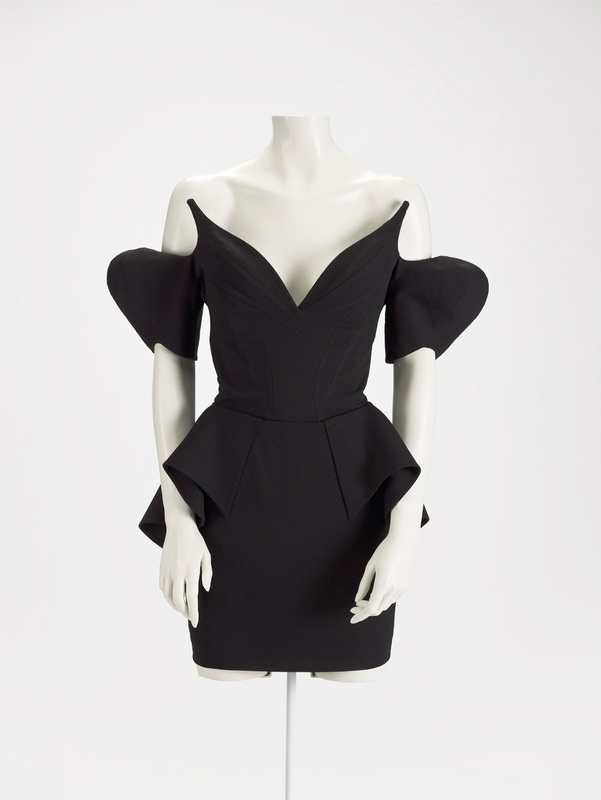 Dress by Thierry Mugler, 1981. Courtesy Indianapolis Museum of Art/Lucille Stewart Endowed Art Fund. As the exhibition suggests, time does not define fashion, while it attests to the physical longevity of certain items, it is our cultural environment that determines what stays and what goes. Let's take for example the dress by Thierry Mugler as a contemporary take on the classic "little back dress," and the motorcycle jacket as the classic item that everlastingly expresses reckless rebelliousness. 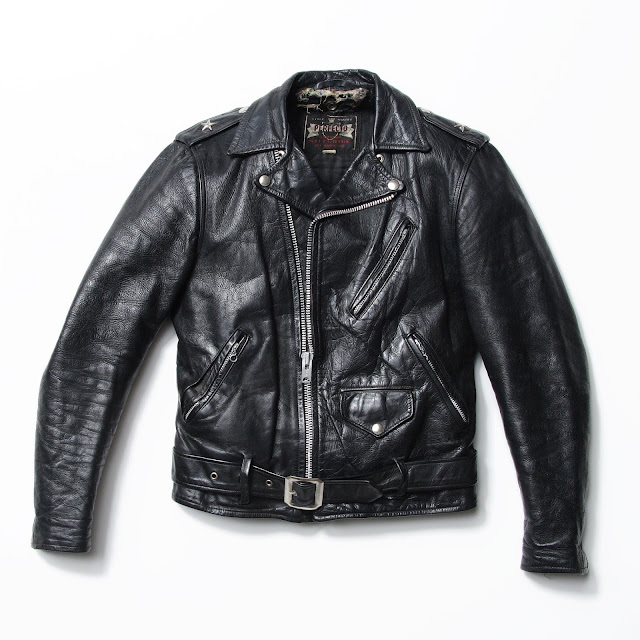 In turn, Thierry Mugler's dress can be seen as a prototype, a material replica based on an archetype, and the leather motorcycle jacket, ever since James Dean in "Rebel Without a Cause," 1955 has become the archetype for generations after generations. In the catalogue that accompanies the exhibition, Antonelli describes that all the items in the exhibition are examined under three tiers, namely- archetype, stereotype and prototype. (P. 22) This method of investigation presents the items in the galleries through a critical lens, and conceptualizes fashion as a social phenomena. Pencil skirt interpreted for Items: Is Fashion Modern? 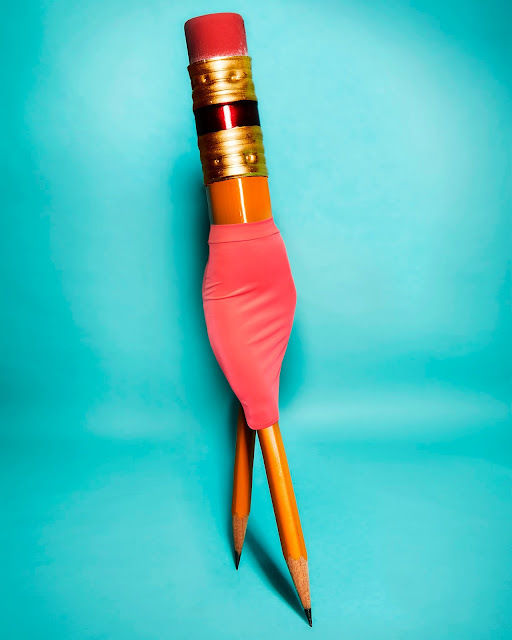 by Bobby Doherty. © 2017 Bobby Doherty. Image courtesy The Museum of Modern Art, New York. In addition to the few ideas I mentioned, the museum's exhibition catalogue dedicates a section for photographers invited and commissioned by Antonelli and the museum to reinterpret some of the pieces in the show through their camera lenses. Another Magazine (founded by Jefferson Hack) has a great review on this, and gives a number of excellent samples on the website. I recommend this read to anyone who is interested in fashion and photography. In the end of Antonelli's essay, she mentions that feedbacks and suggestions are welcome. In fact, would you please tell me why the "Mao Jacket?" The plain, blue button-down of rough cotton was a mandatory uniform for all the country's citizens in the P.R.C. under the one Communist rule of Chairman Mao. Designed specifically as the anti-thesis of fashion, because in the 1960s, the government condemned fashion as shamefully indulgent, it symbolized the "declining morale the bourgeois class. "* And, thus, I am not sure it belongs in this exhibition, just by itself, it becomes a costume, and this of course, is not a costume show. Maybe Antonelli wishes to expand the definition of "fashion." After looking at the "Items" and thinking more about it, and because the exhibition tries to cover so much ground and area, I am not even sure I know what "fashion" means anymore. Back to the drawing board. * "the declining morale of bourgeois class" I refer to is strictly in the context of the Cultural Revolution that lasted ten years in China during the 1960s. The phrase is not to be interpreted in the contemporary context, nor in the Western historical sense. Related article, here, "Fashion, this is not." Related ebook for sale, here.